Conway Historical Society | Dr. William Hamilton's Record Books, Nos. 3 & 6. Dr. William Hamilton's Record Books, Nos. 3 & 6. 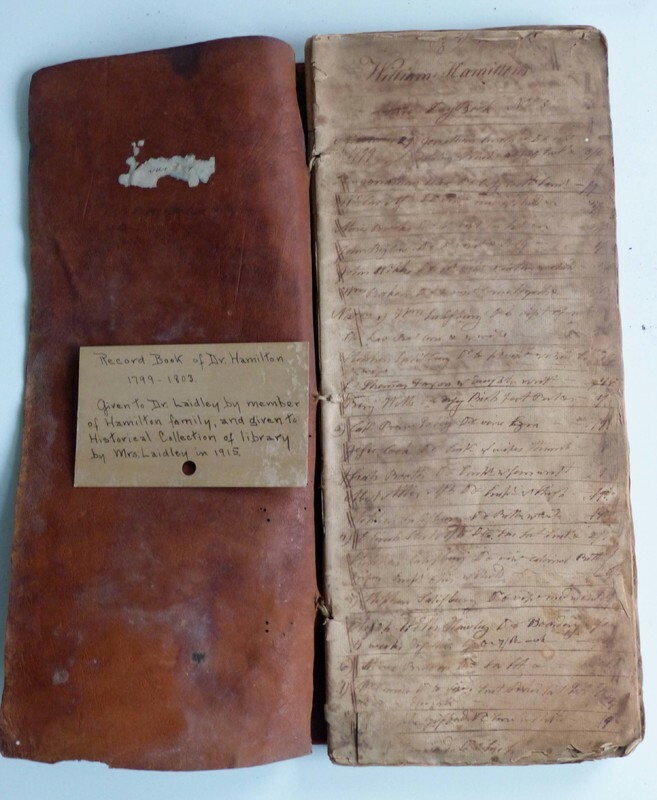 Two leather bound books used as daily medical logs by Dr. William Hamilton. Given to Dr. Laidley by member of Hamilton family and given to Historical Collection of library by Mrs. Laidley in 1915." 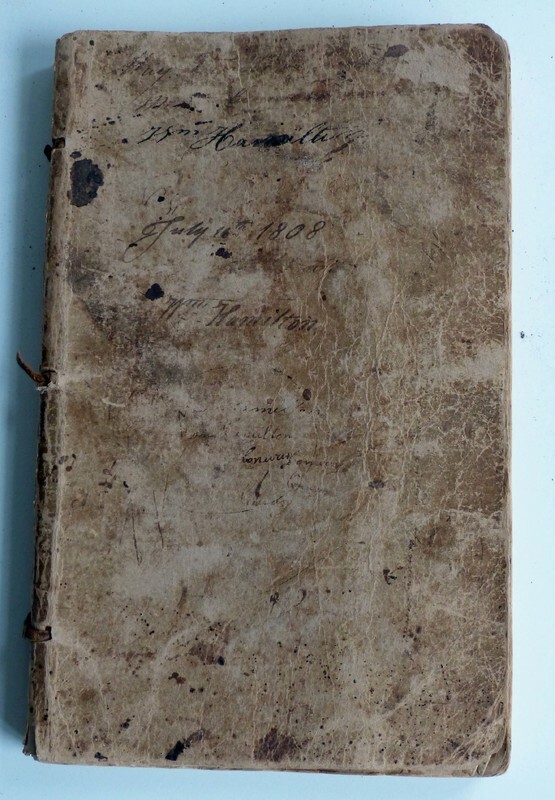 #6 (1808-1810), 7 1/2" x 11 1/2", leather bound, 230 pages of heavy cloth watermarked paper. Paper is folded over and it is tied with three leather straps at the binding, each leaf forming two double-sided pages. Front cover has writing in ink, faded to brown and some illegible. Identifiable is "July 16th 1808" and "Wm Hamilton" appears several times, as does "Conway" and some other marks. On back cover "Wm. Hamilton" also appears. Inside cover identifies it as "Day Book No. 6". Every page has about 20 -25 entries, separated by hand-drawn lines, each line noting a patient, action taken or medicine proscribed, and a notation of fee charged. Heavily worn. Ink has faded and many pages show foxing and stains. Gift of Mary R. Tingley Laidley (1859-1940) to the Field Memorial Library. Hamilton, William, Dr. (1772-1810), “Dr. William Hamilton's Record Books, Nos. 3 & 6.,” Conway Historical Society, accessed April 21, 2019, http://conwaymasshistory.org/items/show/906.